4Gon Solutions is a leading worldwide B2B distributor of wireless communications equipment. 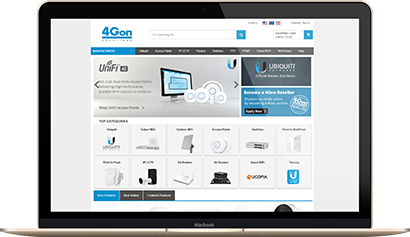 The 4Gon Solutions portfolio features the widest range of market leading brands available today including Ubiquiti Networks, Teltonika, Peplink, Hikvision, Ruckus, Cambium, Cradlepoint and many more. Founded in 2010, 4Gon started with a plan to be a one-stop-shop for wireless resellers, installers, and all those who need access to a wide range of high-quality wireless communications equipment at competitive prices. 4Gon’s staff have extensive knowledge and understanding of our products, we use the same technology we sell and can tailor a solution to any customer’s budget and requirements. 4Gon Solutions recognise the environmental impacts of its operations and is committed to reducing these impacts while still providing exceptional Quality, Service and Delivery. 4Go is accredited to both ISO 9001:2000 and ISO 14001:2004 Quality and Environmental international standards.